In the minute and 15 seconds following that announcement, sharpshooter Ryan Tanoue focused on a target roughly the size of a silver dollar 10 meters away, hoping to zero in on its center, which is the size of a period. He repeated the sequence nine times, with the pressure of an Olympic qualifying spot for the United States at stake. Tanoue, 22, a Saint Louis School graduate, won the 10-meter Air Rifle International Shooting Sports Federation (ISSF) World Cup championship June 18 in Munich by a 10th of a point, securing a berth for the United States in the 2008 Beijing Olympics. A quota spot, or berth into the Olympics, is awarded for select tournaments during the Olympic cycle. Tanoue will still have to qualify for one of two berths on the U.S. team for the 2008 Games. 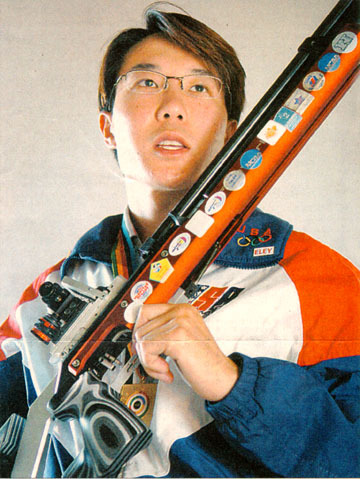 At least I know someone gets to go to the Olympics because of me, even if I dont get the chance to go, Tanoue said. He should like his chances, after outshooting more than 120 competitors from around the world at the World Cup. The championships began with a qualification round, where all shooters take 60 shots, and the top eight shooters advance to the finals, where they take another 10 shots. It was real close, the top four people were tied in the qualification part, said Tanoue, one of the four who scored 597 out of 600 points. In the finals round, the targets are scored electronically, and are scored by 10ths of points. The point totals for the qualification and final rounds are combined to determine the overall winner. Its not uncommon to make up a point in a final, Tanoue said. More often than not, youre going to see someone get passed in the final. Tanoue scored 102.5 out of 109 points to give him a final score of 699.5. Moldoveanu finished with 699.4. 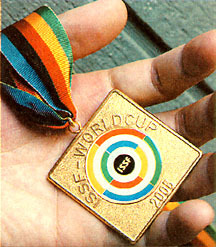 It was Tanoues first win on the international level, although he won the junior bronze medal at the 2002 World Cup in Lathi, Finland. That year, he also won the NCAA air rifle championship as a freshman at the University of Nevada, where he was an All-American all four years. Tanoue, who has competed in Bangkok, Athens, South Korea and Finland, said he plans to graduate from Nevada in May 2006 in psychology. He hopes to reside at the U.S. Olympic Training Center in Colorado Springs after graduation. This summer, he plans to stay in Hawaii until late August, when he leaves to participate. in another World Cup in Munich. He will continue to compete for the U.S. National Team, and hopes his second shot at the Olympics proves successftil. He missed his chance to qualify for the 2004 Athens Games by three points out of a possible 1,800. I think even though I thought I was ready, it doesnt translate to qualifyng, said Tanoue, who improved his chances this time by increasing the United States quota spots total to two at the World Cup. In the three years leading up to an Olympic year, there are 18 chances to earn quota spots for the Olympics. Twelve of those chances come by World Cups (four a year), a World Championship, which awards four spots, and the Pan-American Games, which have two spots. Although it seems like a lot of chances, he said not all events feature U.S. shooters, aRd not all U.S. shooters advance to the finals round. 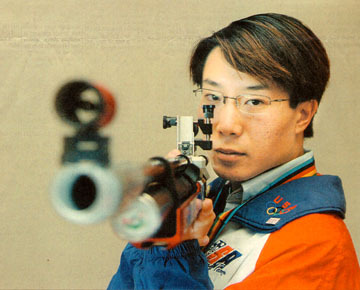 A U.S. shooter won a World Cup in Changwon, Korea, in April, giving the United States both of its quota spots. Tanoue said there is a two-person maximum in each event from each country in the Olympics for air rifle, prone and mens three position. He said for the last Olympic cycle, it took the final qualifying event, the Pan-American Games, for the United States to earn its second quota spot. That makes his win  and the clinching of the second spot  even more special. Before returning home last Thursday, Tanoue flew from Munich to Fort Benning, Ga., for the USA Shooting National Championships, where he finished third and ensured himself a spot on the U.S. National Team. It was important for Tanoue not to suffer a serious letdown after the World Cup so he was satisfied with finishing third. Tanoue said his technique during competition is focusing on the process, what I need to do to take the best shot I can. Especially when Im nervous in the match, you need to get position right, setting up correctly. He said because of the pressure of the situation some shooters hit more nines (out of 10) in the final than in the entire qualification round. The score wasnt the best shot Ive ever shot, but for me I think performance-wise, mentally for me, it was the best over the qualification and the final 70 shots total. I was there 100 percent, Tanoue said. I didnt get frustrated when I shot the nines. I didnt let myself lose my concentration. I didnt lose my focus. That was my best mental performance in any match. Reach Leila Wai at lwai@honoluluadvertiser.com or (808) 535-2457.